The treatment of proximal tibial fractures is often challenging, and internal fixation is occasionally associated with problems in wound healing due to frequently co-existing soft tissue injuries. External fixation of these fractures have yielded satisfactory results, but some studies have reported problems in the achievement and maintenance of fracture reduction. The purpose of the present study was to evaluate the performance of a hybrid external fixator in the treatment of different types of proximal tibial fractures. Thirty-three proximal tibial fractures, of which 20 were high energetic, were treated with a hybrid external fixator (Tenxor® Strker-Howmedica) in the acute phase. 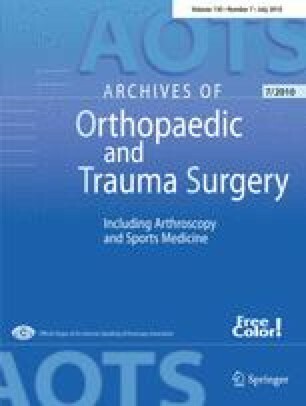 Fracture categorisation was done according to AO/ASIF, and the reduction was performed most often by closed means or through mini-open reduction (26/78.8%). The patients were followed up to an average of 12.7 months (range 10–22) and were evaluated with radiographs and clinical examinations. Five AO/ASIF type-C intraarticular fractures had a poor postoperative reduction, and were thus treated with internal fixation in a second operation. Of the remaining 28 patients, local and transient pin tract infection was observed in seven patients, and one had septic arthritis of the knee. All 13 C1 and five of six C2/C3 fractures united in mean time of 15.1 weeks, whereas three of nine type-A fractures failed to unite, albeit an adequate reduction, and needed a second operation (odds ratio 11.4, 95% CI 1.0–143, compared with type-C fractures). For the remaining six type-A fractures, the mean healing time was 24 weeks (mean difference 8.9, 95% CI 6–12 weeks compared with type-C fractures). Age over 48 and the presence of an open fracture, but not fracture type, gender, or the level of injury energy, correlated to a poor subjective outcome. The hybrid external fixation method we have used is safe, and type-C1 fractures are particularly suitable to be treated with this method. However, even C2/C3 fractures may be candidates for this method, but a meticulous fracture reduction should be performed. Type-A fractures are liable to healing problems when the fixator is used as a rigid complex.